What Is The Brunnstrom Approach? The Brunnstrom Approach was developed in the 1960’s by Signe Brunnstrom, an occupational and physical therapist from Sweden. With seven stages, the Brunnstrom Approach breaks down how motor control can be restored throughout the body after suffering a stroke. Normally, muscle movements are the result of different muscle groups working together. Researchers have termed this collaboration between muscles as “synergies”. The brain has the delicate task of coordinating these movements, many of which become severely affected after a stroke. After the stroke has occurred, your muscles become weak due to the lack of coordination between the brain and body. This causes the muscle synergies to move in abnormal patterns. Most treatments offered to stroke patients will focus on trying to inhibit atypical muscle synergies and movements. The Brunnstrom Approach, on the other hand, teaches patients how to use the abnormal synergy patterns to their advantage. This approach has become a popular choice among both occupational and physical therapists as well as patients since its inception. It can be effective in clinical settings and can dramatically improve voluntary muscle movements after suffering a stroke. The first stage in Brunnstrom’s Approach is the initial period of shock immediately after stroke where flaccid paralysis sets in. Flaccid paralysis (flaccidity) is the medical term for a complete lack of voluntary movement. This paralysis is caused by nerve damage that prevents the muscles from receiving appropriate signals from the brain, whether or not the brain is still capable of moving those muscles. In the early state of flaccid paralysis, the stroke survivor cannot initiate any muscle movements on the affected side of their body. If this continues for long enough without intervention or physical therapy, the unused muscles become much weaker, and begin to atrophy. Simply put, muscles need to be used in order to retain their tone and definition, and flaccid paralysis prevents muscles from doing this important work. The medical term for this loss of muscle tone is hyptonia. Hyptonia causes weakness and sometimes numbness that seriously interferes with a patient’s quality of life. In addition to therapy exercises and treatments that reduce the severity of hypotonia, this Stage 1 condition also requires lifestyle modifications to protect the affected limbs from injury. Though stroke does serious neurological damage, other healthy brain cells and muscles can help make up for some of this damage. In fact, the patient’s own body is full of tools that reduce complications and increase their likelihood of entering new stages of recovery. It’s never too early to start retraining the body and brain after stroke, even if patients are still experiencing flaccid paralysis and hypotonia. The second stage in stroke recovery marks the redevelopment of some basic limb synergies as certain muscles are stimulated or activated and other muscles in the same system begin to respond. Muscles begin to make small, spastic, and abnormal movements during this stage. While these movements are mostly involuntary, they can be a promising sign during your recovery. Minimal voluntary movements might or might not be present in stage two. Muscle synergies result from muscles coordinating movements to perform different tasks. These synergies allow common patterns of movement that involve either cooperative or reciprocal activation of muscle. Because the muscles are linked, one activated muscle may lead to partial or complete responses in other muscles. These synergies may limit the patient’s muscles to certain movements, preventing them from completing the voluntary movements they want to make. However, as neurological development and cell regrowth occur after a stroke, some new connections may be formed to impaired muscle tissue. Two limb synergies determine a patient’s reactions to cell regrowth during Stage 2 of recovery. The first, the flexor synergy, includes the external rotation of the shoulder, flexion of the elbow, and supination of the forearm. The second, the extensor synergy, includes internal rotation of the shoulder with elbow extension and pronation of the forearm. 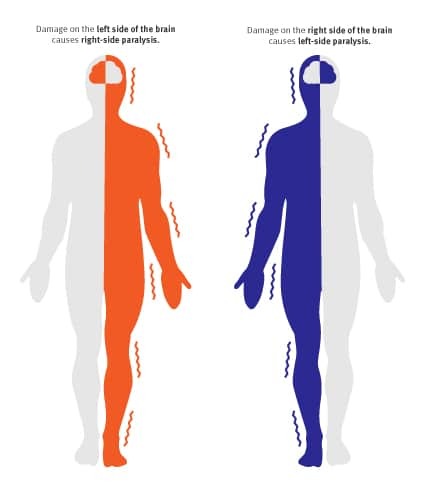 These synergies may produce one or both of the following postures, which indicate varying levels of brain trauma after stroke. Coupled with the presence of muscle synergies, between 30 and 40 percent of stroke survivors also experience spasticity. This is a velocity-dependent increase in your normal stretch reflexes, and during Stage 2, it presents as a resistance to passive movement. Stage 2 spasticity contributes to the jerky upper body movements characteristic of the flexor and extensor synergies. Unused limbs still need stimulation to maintain or form connections to neurons. 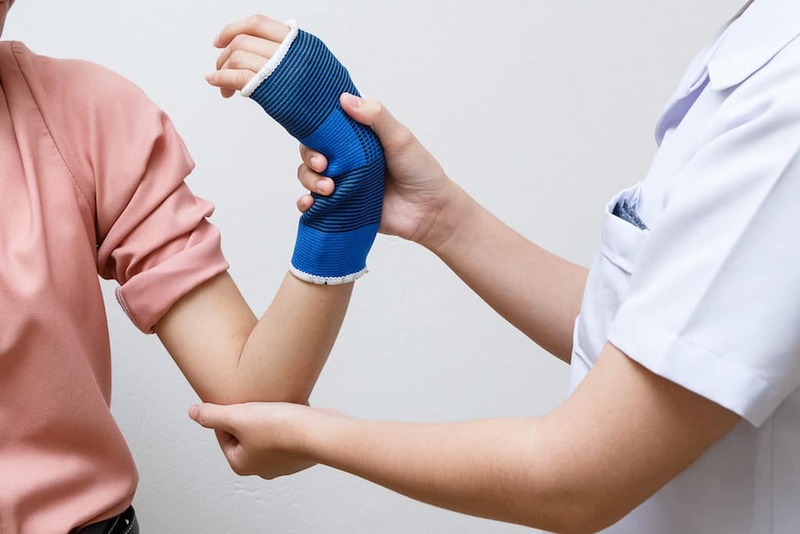 Though the nerves and connections that originally controlled your affected limbs may be damaged too much to create voluntary movements, it could still be possible to regain movement in later stages of recovery. In order to leave this possibility open and prevent the body’s tendency toward learned non-use, it’s important to continue using and moving your affected limbs and muscles as much as possible. Spasticity in muscles increases during stage three of stroke recovery, reaching its peak. Spasticity is a feeling of unusually stiff, tight, or pulled muscles. It is caused by damage from a stroke to nerve pathways within the brain or spinal cord that control muscle movement. The lack of ability to restrict the brain’s motor neurons causes muscles to contract too often. Spasticity causes an abnormal increase in muscle stiffness and tone that can interfere with movement, speech, or cause discomfort and pain. During stage 3, synergy patterns also start to emerge and minimal voluntary movements should be expected. The increase involuntary movement is due to being able to initiate movement in the muscle, but not control it (yet). The appearance of synergy patterns and coordination between muscles facilitate the voluntary movements which become stronger with occupational and physical therapy. Muscles with severe spasticity, like the ones in stage 3 of stroke recovery, are likely to be more limited in their ability to exercise and may require help to do this. Patients and family/caregivers should be educated about the importance of maintaining range of motion and doing daily exercises. It is important to minimize highly stressful activities this early in training. Passive exercises, also known as passive range-of-motion (PROM) exercises, should be continued during this stage to improve your range of motion. Treatment includes how far the therapist can move your joints in different directions, like raising your hand over your head or bending your knee toward your chest. During stage four of stroke recovery, spastic muscle movement begins to decline. 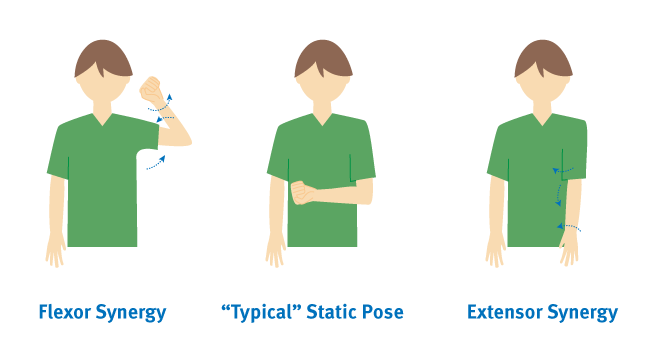 Patients will regain control mostly in the extremities, and they will have a limited ability to move normally. The movements may still be out of sync with muscle synergies, but this will improve quickly over the length of this stage. The focus during this stage is to strengthen and improve muscle control. Now that you are regaining motor control and can start to make normal, controlled movements on a limited basis, you can start to build strength back in your limbs and continue work on your range of motion. Continuing to stretch out your muscles is still important in this stage. Therapists use active-assisted range of motion (AAROM) exercises when a stroke patient has some ability to move but still needs help to practice the exercises or complete the movement. A therapist may help guide the movement with their own body (hold the limb, for example) or use bands and other exercise equipment to support the patient. Gravity-assisted devices such as the SaeboMAS, are beneficial in helping the patient perform the movements. You can begin active range-of-motion (AROM) exercises once you have regained some muscle control and can perform some exercises without assistance. They often involve moving a limb along its full range of motion, like bending an elbow or rotating a wrist. AROM exercises increase flexibility, muscle strength, and endurance. Range-of-motion exercises should be practiced equally on both the affected and unaffected sides of the body. 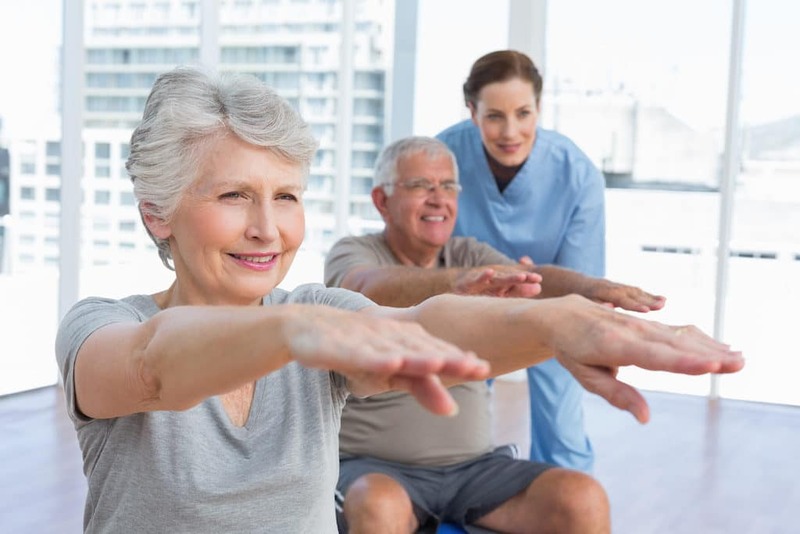 Of course, when it comes to building a stage 4 stroke recovery exercise program, you should always consult with a professional physical or occupational therapist. They can help you with exercise specifics, finding the right tools and equipment, and, of course, to provide assistance, especially in the beginning. In stage 5, spasticity continues to decline and synergy patterns within the muscles also become more coordinated, allowing voluntary movements to become more complex. Abnormal movements also start to decline dramatically during stage 5, but some may still be present. The patient will be able to make more controlled and deliberate movements in the limbs that have been affected by the stroke. Isolated joint movements might also be possible. All voluntary movements involve the brain, which sends out the motor impulses that control movement. These motor signals are initiated by thought and must also involve a response to sensory stimuli. The sensory stimuli that trigger voluntary responses are dealt with in many parts of the brain. Voluntary movements are purposeful and goal-directed. They are learned movements that improve with repetition or practice and require less attention. Some examples include combing hair, swinging a bat, driving a car, swimming, and using eating utensils. 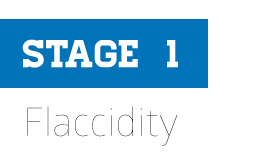 At stage six, spasticity in muscle movement disappears completely. You are able to move individual joints, and synergy patterns become much more coordinated. Motor control is almost fully restored, and you can coordinate complex reaching movements in the affected extremities. Abnormal or spastic movements have ceased, and a full recovery may be on the horizon. The last stage in Brunnstrom’s Approach is when you regain full function in the areas affected by the stroke. You are now able to move your arms, legs, hands, and feet in a controlled and voluntary manner. Since you have full control over your muscle movements, synergy patterns have also returned to normal. Reaching stage seven is the ultimate goal for therapists and patients alike. With the seven stages of recovery, Brunnstrom effectively changed the way stroke recovery is approached by occupational and physical therapists. She theorized that spastic and primitive muscle movements were a natural part of the recovery process after a stroke. 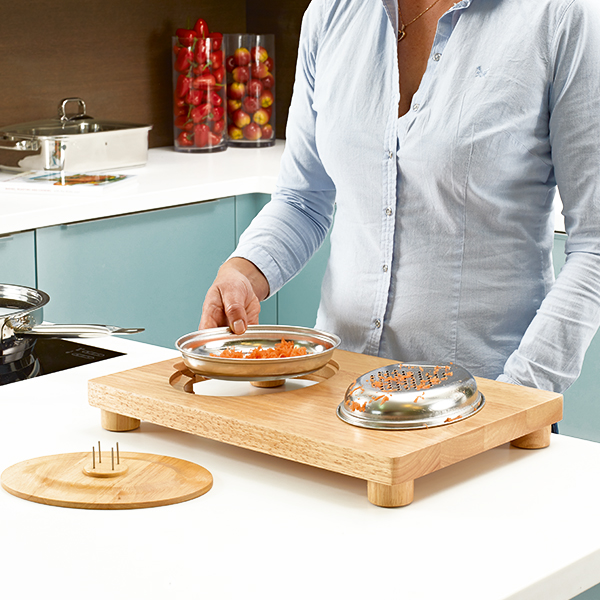 Moreover, she developed an approach that allows patients to use these involuntary movements to their advantage instead of trying to inhibit them. During each phase, an increasing amount of synergies are available to use. Using the Brunnstrom Approach, occupational and physical therapists will teach you how to use the synergies that are currently available to you. These techniques are used to improve movement and regain motor control. There is no one approach to stroke recovery, and the stages laid out in these guides may not apply to everyone. Since the Brunnstrom Approach can be effective, however, therapists still use this method to help patients recover after suffering a stroke. Thanks to new medical technology, therapists can use the Brunnstrom Approach in conjunction with tools like the SaeboGlove, SaeboReach, and SaeboMAS to help patients reach new levels of independence. This post was originally published on Sep 9, 2015 and this post was updated on Feb 2, 2017.